Part of the re-do for the living, besides the paint job and the chandelier, was a new, ultra high definition, really big TV. I went with Samsung. I have a Samsung smart TV up in the bedroom and it works quite well. The new TV was delivered by FedEx on 9/27, while I was painting. Even though there were two men in the truck, only one got out, opened the rear doors, and pulled out my new TV. Evidently they didn't know that because of the size 2 people were required to move the thing. He lifted it up, kind of spun it around and brought the end down on the curb all the while saying, "I don't know why they only put handles at the ends." So, I went out and helped him carry the new TV up to the house. I finished painting and went to the movies with a friend. On 9/28 I got up and opened the box. Everything looked fine. I attached the wall mount to the wall and the brackets to the back of the TV. It took about 30 seconds to hang it and another minute and a half to plug it in and connect the Xbox one. I turned on my new, very expensive, curved screen, UHD television and watched as something white blossomed up and down the right hand side. I stared at it for about... oh, say a minute or two, hoping the damn thing would go away. It didn't. This brand new, very expensive TV has some serious pixel damage. So, I called Samsung. 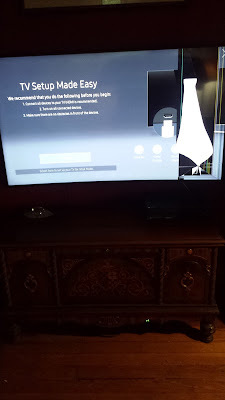 The agent wanted to try and fix the problem using my remote, except, well, this is a brand new TV - meaning a new model. It took him 20 minutes to get the right remote info, and then another 40 minutes while he had me press this button, and then the same button again - the new remote only has 5 buttons. Finally, he checked to make sure it was still in warranty and then said, "I will set you up to have a repairman come out, he will call within 24 - 48 hours." I'm thinking maybe when the sole delivery man brought it down on the curb he did the damage. I've also checked on line and pixel damage can be repaired as long as the glass isn't broken, but it can be very, very expensive. I've also notified Amazon just in case the damage is severe enough to warrant a replacement television. Anyway, I'm using my old 46" Sony Bravia until this dust settles. I'd send it back at once and notify the delivery service about the way it was [man]handled. It's new, there should be no problems!